Webster Slaughter was one of the players on the Browns that I loathed and hated the most when he played against the Oilers back in the 80’s. I also equally respected him for his skills and ability to take the ball to the house when it counted most. Many times when I turned on the TV and saw him line up against the Oilers Man to Man defense in the days of Schottenheimer versus Glanville, I’d see Slaughter take a wobbly pass out of the air from Kosar, and streak up the sidelines leaving either Patrick Allen or Steve Brown in his dust. The Browns made him their second round choice of the 1986 draft out of San Diego State. The draft was notable with having some consistent receivers in it. Tim McGee and Ernest Givins were taken off the board a few picks before Slaughter’s card was rushed to the podium by the Browns, while Hassan Jones and John Taylor were taken afterwards. Slaughter was taken under the recommendation of HoF Brown WR Paul Warfield, whom was acting as a non-defacto scout for the franchise at the time. With deceptive speed and an amazing frame (6’0″, 175) Slaughter quickly found a bond with quarterback Bernie Kosar. The two formed a great duo to keep teams honest against the run when the ground and pound would come to a halt. His best season came in 1989 with the Browns. Slaughter had a career high 1236 yards, averaged a franchise high 19 yards per reception, and 6 touchdowns, one of which went for 97 yards against the Bears. Against the Oilers that year he had a 77 yard and an 80 yard touchdown en route to a 184 yard performance. 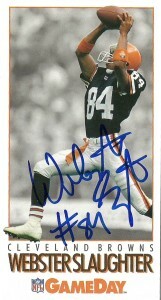 Webster became embroiled in a contract dispute with the Browns- something he had done with frequency as early as 1988. Unhappy with second year head coach Bill Belichick’s offensive system, Slaughter held out. Although Plan B was the current status quo, Slaughter felt he was a top dollar receiver and wanted to be paid like it. Unable to negotiate with the Browns, he sued the team and became a landmark plantiff that helped bring about the retooled Free Agency System that went into effect during the 1992 season. With the Oilers hunting for a replacement to departed Drew Hill, they immediately snapped up Webster to go alongside Curtis Duncan, Haywood Jeffires, and Ernest Givins in their Run ‘N Shoot receiving corps. That season as he worked into the lineup, Slaughter spent the majority of his time fielding punts. He’d earn Pro Bowl honors for his 1993 season, starting in 14 games (904 yards, 77 receptions and 5 touchdowns). Slaughter was content with the Oilers, but with the departure of Warren Moon after the 1993 season and the team rebuilding, Webster knew it was a matter of time before he was done in Houston. While his numbers in 1994 were slightly down, the team opted not to resign him. Instead Webster made a move to KC, turning down richer suitors to play for his former head coach in Cleveland, Marty Schottenheimer. While the reunion would last only one season, Slaughter managed to average 15.4 YPR on 34 catches and 4 touchdowns with quarterback Steve Bono at the helm. He’d sign with the Jets in 1996, but the horrendous team finished at a dismal 1-15. After a season out of the game, Webster played for the Chargers, closing out his career in 1998. He dabbled with playing again as late as 2001 with the Redskins, but finally embraced retirement fully. Slaughter is a difficult player to obtain TTM. He’s another guy I sent to, and failed miserably to get an autograph from. It is now common knowledge that Webster refuses to sign TTM because he does not want to confirm his address. I was more than happy to pay to get this elusive member of the Browns and Oilers finally into the collection, but still have quite a few more that I’d like to get autographed at a later date since he has so many great cards. Webster is a fairly popular member of the Cleveland Browns and has been seen at many alumni functions.